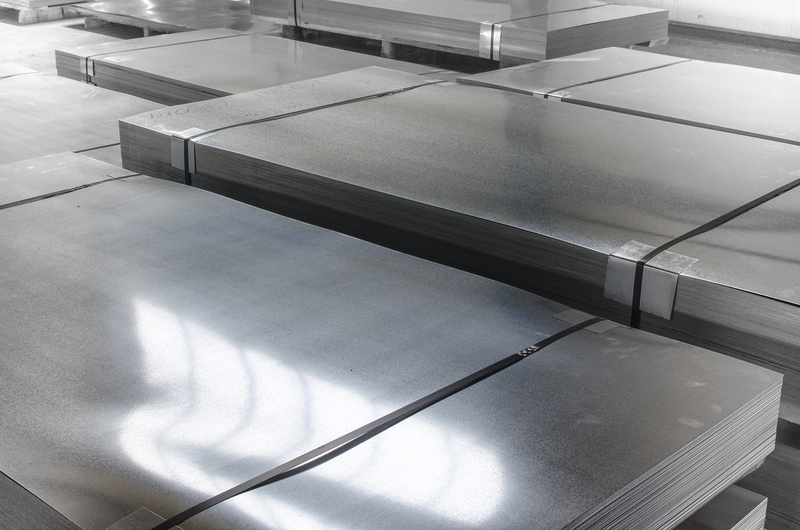 In our extensive line of products, we offer stainless steel sheets and stainless steel plates. Stainless steel sheet is typically sold in the annealed condition and is available in most grades. Our stainless steel sheets come in both a standard 2B finish and various polished finishes. Polished surfaces range from the standard #4 to a mirrored finish #8 and are usually covered with a removable vinyl coating. Our standard sheet sizes include 4’ x 8’, 4’ x 10’, and 5’ x 10’, but customized sizes are also available. Cut sheet is generally sheared to size, but may be laser cut or waterjet cut upon special request. Stainless steel plate is sold in the HRAP (Hot Rolled Annealed and Pickled) condition and finish. Like sheet, stainless steel plate comes in standard sizes varying in width from 4’ to 8’ and in length from 8’ to 20’, but can also be customized to suit the application. Stainless cut plate may be sheared in thicknesses up to 3/8”, and plasma cut in thicknesses over that. Waterjet, band-saw, or laser cutting is also available. If you can’t find the size or grade that you’re looking for, feel free to contact us for assistance. Available Steel Grades:304, 304L, 316/316L, 301 Ann, 301QH, 301HH, 301FH, 302, 309, 310, 321, 330, 347, 409, 410, 430, 600, 625, 718, 15-5, 17- 4, 17-7, A286, 2205 and more! We offer 26 Ga to 7 Ga sheet in various widths and lengths. We will cut to size! Our team can plasma cut, laser cut, or waterjet cut to your specifications. Polishing services are also available. P-2-3/4″ x 60″ x 120″ Stainless Steel Plate	 60" x 120"
P-2-3/4″ x 60″ x 144″ Stainless Steel Plate	 60" x 144"
P-2-3/4″ x 60″ x 240″ Stainless Steel Plate	 60" x 240"
P-2-3/4″ x 72″ x 144″ Stainless Steel Plate	 72" x 144"
P-2-3/4″ x 72″ x 240″ Stainless Steel Plate	 72" x 240"
P-2-3/4″ x 96″ x 120″ Stainless Steel Plate	 96" x 120"
P-2-3/4″ x 96″ x 144″ Stainless Steel Plate	 96" x 144"
P-2-3/4″ x 96″ x 240″ Stainless Steel Plate	 96" x 240"
P-3″ x 48″ x 96″ Stainless Steel Plate	 48" x 96"
P-3″ x 48″ x 120″ Stainless Steel Plate	 48" x 120"
P-3″ x 48″ x 144″ Stainless Steel Plate	 48" x 144"
P-3″ x 48″ x 240″ Stainless Steel Plate	 48" x 240"
P-3″ x 60″ x 96″ Stainless Steel Plate	 60" x 96"
P-3″ x 60″ x 120″ Stainless Steel Plate	 60" x 120"
P-3″ x 60″ x 144″ Stainless Steel Plate	 60" x 144"
P-3″ x 60″ x 240″ Stainless Steel Plate	 60" x 240"
P-3″ x 72″ x 144″ Stainless Steel Plate	 72" x 144"
P-3″ x 72″ x 240″ Stainless Steel Plate	 72" x 240"
P-3″ x 96″ x 120″ Stainless Steel Plate	 96" x 120"
P-3″ x 96″ x 144″ Stainless Steel Plate	 96" x 144"
P-3″ x 96″ x 240″ Stainless Steel Plate	 96" x 240"